Summary: Star Trek with cats. 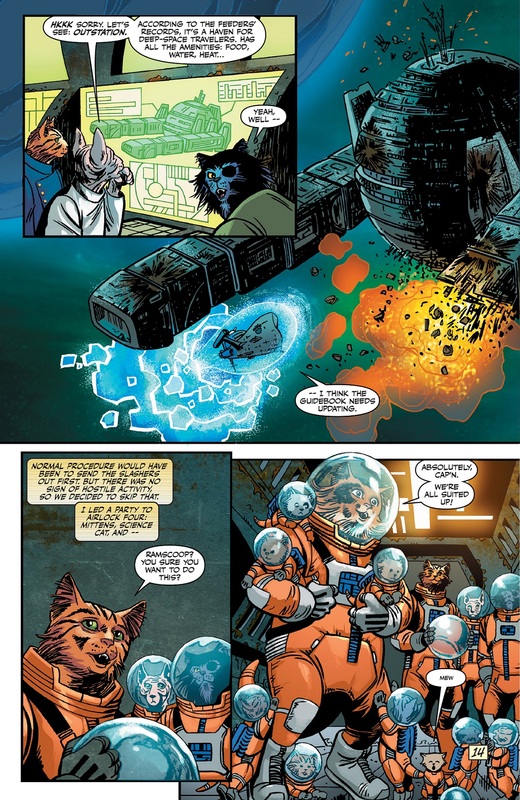 Writer Stuart Moore and artist June Brigman join forces to bring AHOY Comics third title, a sci-fi feline adventure, called Captain Ginger. The human race has been wiped out by hostile aliens, leaving the cats to inherit the Earth and the technology left behind. The story follows Captain Ginger, a bold, brave and ambitious ginger tabby that is captain of the Starship Hiss-Bite-Claw-Sometimes Fall. After the “Feeders” died out from a hostile alien takeover by the”Lumen’s”, the cats were left behind and slowly evolved and gained the ability to think and talk. They now explore space, trying to survive in a dangerous and hostile universe. However, this isn’t the only problem for Captain Ginger, as there is dissent in the ranks, as his second-in-command mousing officer, Sergeant Mittens, challenges his authority and outright disobeys his orders. After narrowly escaping an encounter with the Lumen, they come across an abandoned space station. Believing that they have found sanctuary, Mittens leads his fellow felines onboard, wishing to live there and stay amidst the rats, blankets and pillows…kitty utopia! It’s up to Captain Ginger to reel in his mutinous crew before the Lumen’s find them and obliterate them once and for all. 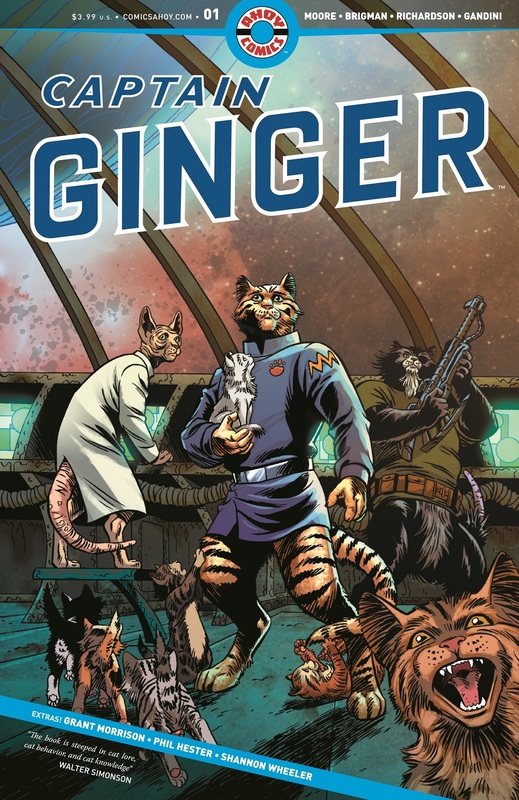 I’m a cat person and a total lover of science fiction, so when I read the description of Captain Ginger, I had a sneaky suspicion that I was going to like this story. I’m all about character driven stories that focus of the motivations, fears and subsequent layers of the characters, usually coming from a place of external and internal conflict. 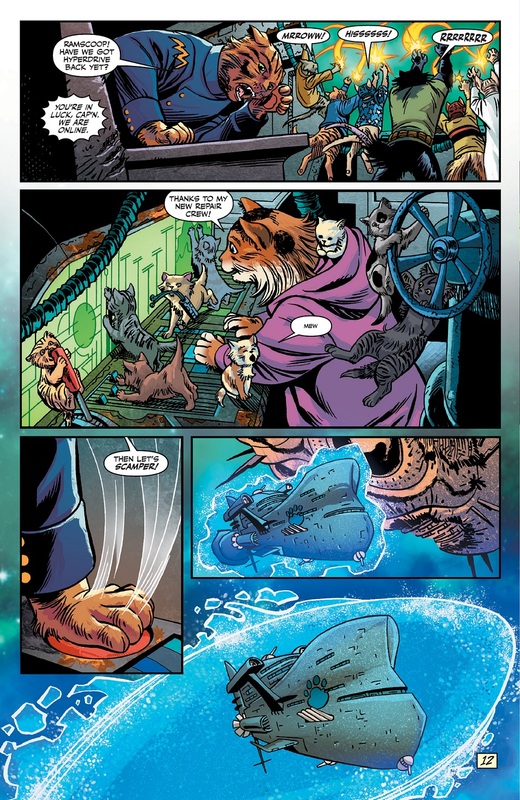 We get to see some of this within Captain Ginger himself, as he struggles with his identity and questions if he should behave like a human or a cat. This conflict alienates him, as his crew succumb to their animal instincts. I also really liked was how the captain, crew, hostile aliens, problems and problem solving all feels like it could easily fit into an episode of Star Trek. 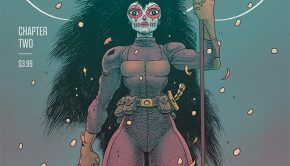 The space opera setting is one of the main reasons I dig this comic. Of course, instead of humans we have anthropomorphic cats, however, these kitty cats are intelligent, diverse and come with their own emotional complexities. Stuart Moore also makes it all very fun to read, injecting a lot of humour within the dialogue and banter between the cats. I really love how he uses basic “cat lingo” to describe objects and certain activities. Also, the cats may have evolved, but they still possess their basic feline instincts. So when they see a rat or a squiggly line on a screen, they can’t help but pounce and chase it. This of course made for some rather entertaining moments, as we see cats wearing Starship uniforms, playing with their command controls…naww. 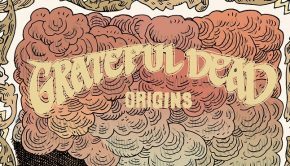 I should also mention that being an AHOY Comic, there are a bunch of extra goodies at the end of the issue, which includes editors notes, fictional prose and interviews. It’s more of a comic magazine and offers a great deal of extras that somehow relate to the main story. I love this about AHOY! The art is by legendary artist June Brigman, who captures these evolved kitties in all their anthropomorphic feline glory. 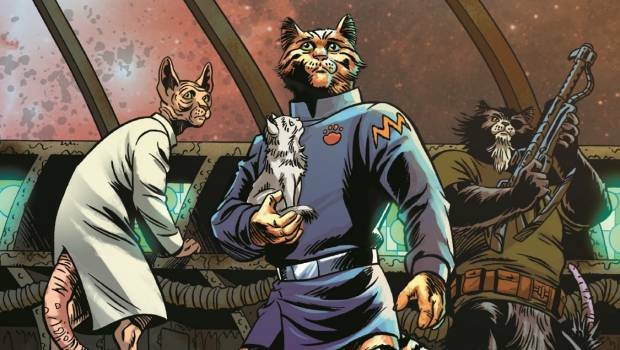 We see a diverse array of cats, all kitted out in human clothes, doing human/cat things whilst getting about on a starship in space. Visually, what’s not to love? Brigman brings her lovely art to create a wonderfully detailed and dynamic visual narrative. I really love the individual look of each of the cats, and it’s always fun seeing them have human-like expressions and facial nuances. We also get to see an excellent space battle at the beginning of the issue, which is a bit epic and a good chance for us to get a good look at the tech and the overall look of the ships. The colouring by Veronica Gandini is bright and vibrant, which is nice to see, as space is usually so monotone and dark looking. Each page is awash with pops of colour, and there is quite literally never a dull moment. Overall, I thought that Captain Ginger was a fun and adventurous frolic. 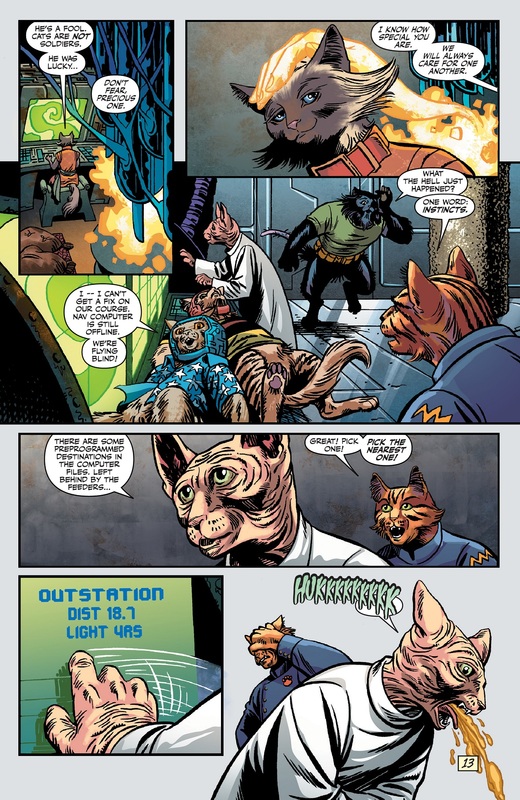 You had me at evolved cats in space. Nuff said! 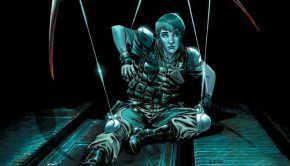 I’m giving this issue 4.2 out of 5 stars! 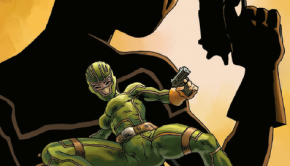 CREATIVE TEAM: Stuart Moore, June Brigman, Roy Richardson, Veronica Gandini, Grant Morrison and Phil Hester.